Award-winning Finnish-Estonian novelist Oksanen (When the Doves Disappeared, 2015, etc.) tackles the global exploitation of women and the entwined secrets of two families in this story of a woman with magical hair. Intensely private Norma Ross has just lost her mother and closest confidante in an apparent suicide. A stranger named Max Lambert accosts her at the funeral and tells her they have "unpleasant business" to take care of. As Norma attempts to uncover the truth behind her mother's death, she finds herself threatened by powerful factions within the Lambert clan, all vying for control of a global hair salon operation with sidelines into darker business ventures. Norma's miraculous hair is both blessing and curse, making her incredibly sensitive to smells and giving her the ability to detect lies and communicate with a dead ancestor whose own magical hair committed a double murder. 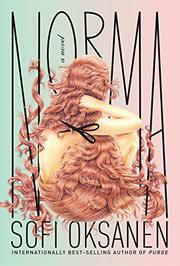 Smoked in a pipe, Norma's hair also serves as a drug that drives at least one character crazy. Inside the Lambert family, alliances form and shift, no one is safe, and everyone wants to discover the source of the hair Norma's mother had been selling before she died. As the entangled plots wind tighter, surrogacy and baby farming are added to the clan's nefarious activities: "Girls and children were so cheap in Nigeria, and the hair business created a perfect front." Oksanen raises some important points. As one character puts it, women "still don't take home the profits even though we provide all the material and all the labor for the beauty industry. Century after century we've given our faces, our hair, our wombs, our breasts, and still the money ends up in men's pockets." But too many characters feel underdeveloped, and the writing is often weak: "Their kind dwelled endlessly on a tragedy until all the blood and marrow had been sucked out of it, gnawing at possible underlying factors with the same devotion as dieters who try to lose weight with gimmicks like slow chewing." In spite of promising material, the question of who will emerge victorious loses its urgency along the way, and the ending, though surprising, fails to satisfy.